Make great cider at home with just a few ingredients and minimal equipment--with some help from Stephen Wood and the crew behind Farnum Hill Ciders. In Apples to Cider, these cidermakers and their colleagues share decades of experience and a simple philosophy: Cider is all about the apples. Whether you are a home brewer, a home winemaker, or simply a cider lover, you can join the growing community of cidermakers that are reviving this thousand-year-old craft. 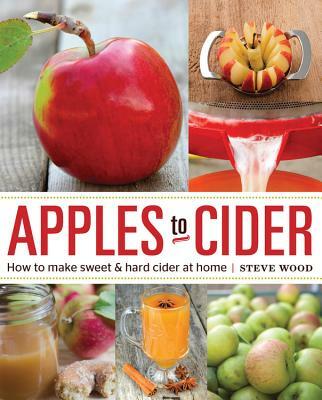 With these easy-to-follow instructions for first-time cidermakers and advanced techniques for the more experienced, you'll be on your way to making your own delicious cider at home. Stephen M. Wood started Poverty Lane Orchards and Farnum Hill Ciders twenty years ago when he bought the New Hampshire orchard where he had spent summers as a boy. Today, that orchard is the largest plantation of cider apples in the United States. Before coming to cider, Wood collaborated on television documentaries, worked on a hard-rock mining crew in Colorado, and picked up a degree in History from Harvard. April White's craving for good food and great stories has taken her from the kitchens of Philadelphia to the goat farms of Tuscany, the paladares of Havana, and the tchouk huts of West Africa. The award-winning food writer penned Chickens in Five Minutes a Day with the staff of Murray McMurray Hatchery and Get Your Goat with goat farmer Brent Zimmerman. She is also the author of The Philadelphia Chef's Table and other cookbooks. See her latest work at aprwhite.com.